PARIS - Four people have been arrested in the Paris region and France's interior minister says there were fears that they were planning an imminent attack on the French capital. Few details were available on the Wednesday morning arrests. French Interior Minister Bernard Cazeneuve said the four were taken in for questioning, including one man under house arrest who was suspected to be in contact with Islamic State of Iraq and Syria (ISIS) extremists. Judicial and police officials, who requested anonymity to discuss the detentions, said one of the four was a woman, all were born in France and they were between 21 and 30 years old. A subsequent search found an unused Kalashnikov cartridge, SIM cards, USB cards and a gun for firing blanks. 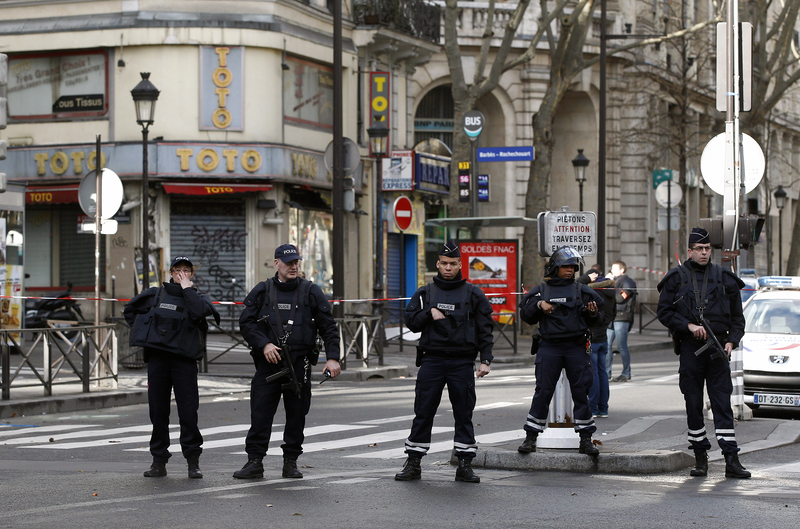 Tensions are high in France since the Nov. 13 attacks in Paris that left 130 people dead. Cazeneuve said French counter-terrorism officials have been busy, making 74 similar such arrests this year alone. Meanwhile, investigators in neighboring Belgium were hunting Wednesday for two suspects who fled an apartment linked to the Nov. 13 Paris attacks, one day after a police sniper killed a gunman holed up inside and authorities found a stock of ammunition and an ISIS flag there, officials said. Four officers were wounded in Tuesday's joint French-Belgian raid in a Brussels neighborhood and related searches. The neighborhood, Molenbeek, was home to several people involved in the Paris attacks. Prosecutors on Wednesday released without charges two men they held in the wake of the raid, leaving the hunt on for two suspects who have not been identified. Prosecutor Eric Van der Sypt said they "are being actively sought." The dead man was identified as an Algerian man living illegally in Belgium, Mohamed Belkaid, whose only contact with authorities appeared to be a two-year-old theft charge, said Thierry Werts, a Belgian prosecutor. Belkaid, 35, was shot to death by a police sniper as he prepared to fire on police from a window, Werts said. A Kalashnikov was found by his body, as well as a book on Salafism, an ultraconservative strain of Islam. Inside the apartment in the Forest neighborhood of Brussels, police found the banner of ISIS as well as 11 Kalashnikov loaders and a large quantity of ammunition, the prosecutor said. The anti-terror raid was linked to the Nov. 13 gun-and-bombing attacks on a stadium, cafes and a concert hall in Paris that left 130 people dead. ISIS claimed responsibility for the Paris attacks, in which Belgian citizens played key roles. Since the Paris attacks, officials say 58 people have been detained in Belgian searches directly linked to the Paris attacks investigation and another 23 arrested in related probes.